One of the reasons that I started sewing was because I didn't want to dress exactly like anyone else. I feared showing up to a party or event and seeing someone wearing the same Forever 21/Express/H&M outfit. I love how sewing your own clothes can express your individuality and creativity. But why stop at clothing? Why not sew your own accessories too? 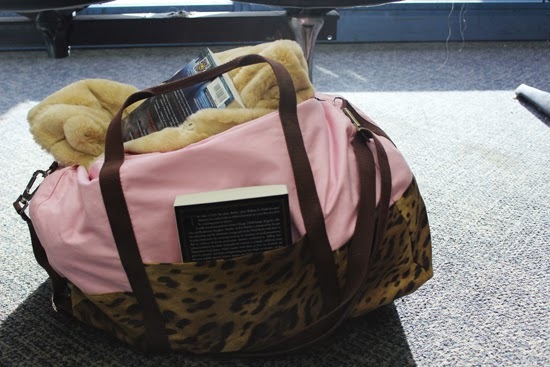 In comes the Portside duffel bag by Grainline. Jen designed a seriously cute and functional bag pattern that is perfect for a weekend getaway or a plane carryon. The pattern is designed with an advanced beginner in mind, but with a little patience I think anyone can tackle this pattern. I'm usually the queen of a million questions, but I was able to sew this bag no problem and with no confusion. Another perk about the pattern is that it doesn't use crazy fancy hardware that is hard to source. Other than fabric, interfacing, and webbing the only things you will need are D-Rings and the swivel bolt snaps/hooks. My local fabric shop doesn't carry the most extensive selection of hardware and I could find everything I needed for this project easily. 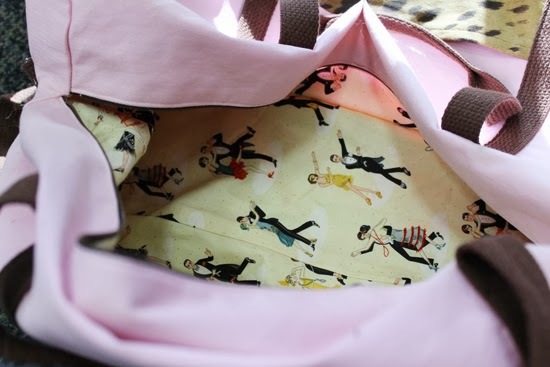 When I make another version (apparently I am making one for my husband, he told me so) I might use stiffer fabrics to hold the bags shape or use interfacing on the exterior pieces. My fabric choices work fine when the bag is stuffed full, but the bag doesn't look as great when it is empty. Pockets on the inside would also be a good addition. The outside pockets are perfect for carrying books! My bag has now been to three countries (United States, England, and France) and has been on trains (or the "tube," as the English say) and planes, so I feel confident in saying that it is my traveling sidekick. I don't want to leave home without it! Shout out to LAX for the photo shoot location. Thanks, dudes. Taking photos is a great way to waste time during a four hour layover. Love the lining fabric! I would love to make this with black on the bottom and a snow leopard print on the top - would be amazing! Thanks for the new discovery :) This needs to be added to my list of things to make! It's such a stylish bag! 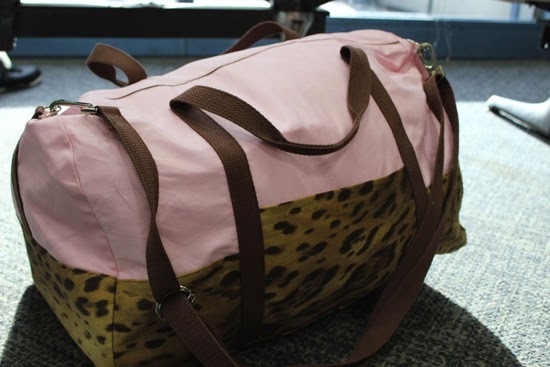 I love the fabrics you've chosen, just the thing to make you smile when traveling gets stressful! This is SO cute! I love the fabrics you chose-- absolutely adorable! I realllllly want to make this bag, but I'd have to sew it on the sly... I've been forbidden to add any more bags to my collection! (They're my weakness-- I loooooove shoulder bags/travel bags/duffel bags/tote bags/ANY AND ALL BAGS). OMG, that bag is perfect!! 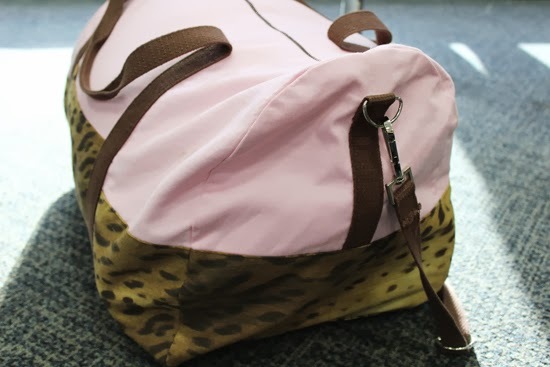 I love the leopard and pink combination - so you!! The 20's lining fabric made me smile. Man, you are awesome! What a cute bag! The color and pattern combination is so fun. I hope the 4 hour delay wasn't too much of a pain. I traveled a lot this holiday season and it was a mess! I made one of these for my Dad for Christmas (http://nightingaleanddolittle.blogspot.co.uk/2014/01/grainline-portside-duffle-bag.html) - I loved the pattern but it took a lot of willpower to buy Dad-appropriate fabric instead of all the pretty things that I like! I love your version - it's definitely made me think I might need to make another version for me! That's the best looking duffle bag I've ever seen! I'm going to have to buy this pattern now I've seen yours! It's so unique and lovely! Perfect for you too! Very nice! Love the lining. Awesomeness! 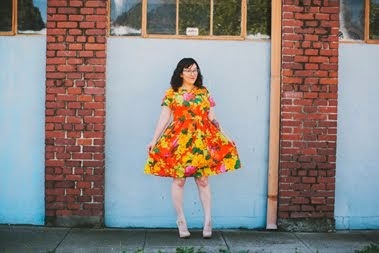 Seriously, this pattern is on my immediate to-sew list post Project WD. It's such a fabulous thing - and I love your version! Gorgeous - looks like the perfect size & I love your fabric combination!! I love this! pretty sure I need one now too.. I love this bag, Erin!! It's so YOU (awesome. clearly.). I bet you got a ton of compliments while carrying it. I love that there's no insane hardware needed to put it together. I reaaaallllllllyy want to make one now after seeing yours!